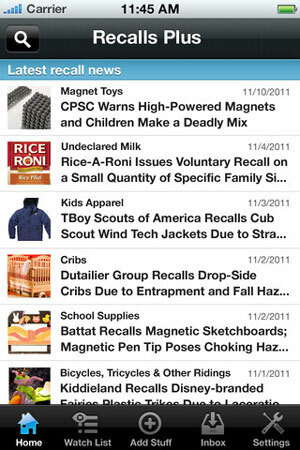 Germaphobes, parents of young children or anyone with food allergy concerns take note: There’s a free Apple iOS, Android and Facebook app called Recalls Plus that you can use to get the latest news on product and food safety recalls. In the U.S., more than 50,000 children under the age of 5 are treated each year in emergency rooms for injuries from recalled products and 87 children die from these injuries, according to the Consumer Product Safety Commission. And that's just products. 1 in 6 Americans gets sick from contaminated foods each year. Food makers neglect to list common allergens like nuts, eggs and milk on their ingredient lists. Government agencies determine that dangerous bacteria have colonized in foods on store shelves. Manufacturers realize a product they’re selling can harm people. It happens all the time, but often consumers don’t hear about these problems unless they pay close attention to what the media is reporting but even then it can be difficult to stay informed. It can’t be denied that recalls can save lives, so it’s no wonder that software giant SAP recently released Recalls Plus as its first-ever mobile app for consumers. The app is worth perusing for several reasons. The interface features a stream of alerts as its main component. A few recent posts warn about things like 3,000 lbs of sausage that was mislabeled, sandwich products that may be contaminated with Listeria, 756 cases of lettuce that may cause Salmonella poisoning, plus many more. 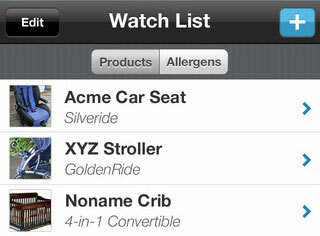 It also lets you create custom lists of brands and products you want to watch such as car seats, cribs and strollers. But what's especially slick is how you can set up these lists based on the ages of your children so in mere seconds you can be set up to receive alerts based on the products, gear and other stuff you're using every day with your infant or toddler. You can also track allergen-related recalls, an important and valuable feature for anyone with serious food allergy concerns. Again, you can’t imagine how often food packaging doesn’t list ingredients that could be harmful to some people. And if you see an alert you want to share with others you can post the recall information to your Facebook wall in two clicks. Also do check out Recall Alarm app and website, which is now out in Beta. What makes Recall Alarm different is that it allows you to enter and register your own product via our secure website. You can categorize products (for example, “toys”, “automobile” etc) with your own custom tags so that it is very easy to organize the products you register. The Recall Alarm app, available on iPhone and Android platforms, is a unique app which makes registering products with Recall Alarm as easy as scanning the barcode on the product. Simply scan the barcode, and not only will the product be checked for previous recalls, but will also be registered to your profile, to be monitored for future recalls.